The African wild dog or Prairie dog (Lycaon pictus) is a carnivorous mammal of the Canidae family. It has a wide distribution in Africa. It is variously called the African Wild Dog, African Hunting Dog, Cape Hunting Dog, Painted Dog, Painted Wolf, Painted Hunting Dog, Spotted Dog, or Ornate Wolf. 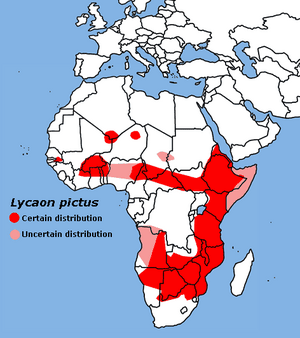 The scientific name "Lycaon pictus" is derived from the Greek for "wolf" and the Latin for "painted". It is the only canid species to lack dewclaws on the forelimbs. Adults typically weigh 18–34 kilograms (40–75 lb). A tall, lean animal, it stands about 75 centimetres (30 in) at the shoulder, with a head and body length averaging about 100 centimetres (39 in) long with a tail of 30 to 45 centimetres (12 to 18 in). Animals in southern Africa are generally larger than those in eastern or western Africa. for a total of 42 teeth. The premolars are relatively large compared with those of other canids, allowing it to consume a large quantity of bone, much like hyenas. The heel of the lower carnassial M1 is crested with a single cusp, which enhances the shearing capacity of teeth and thus the speed at which prey can be consumed. This feature is called trenchant heel and is shared with two other canids: the Asian Dhole and the South American Bush Dog. The African Wild Dog has a bite force quotient measured at 142, the highest of any extant mammal of the order Carnivora, although exceeded by large marsupial carnivores. The BFQ is essentially the strength of bite relative to the animal's mass. The African Wild Dog may reproduce at any time of year, although mating peaks between March and June during the second half of the rainy season. The copulatory tie characteristic of mating in most canids has been reported to be absent or very brief (less than one minute) in the African Wild Dog, possibly an adaptation to the prevalence of larger predators in its environment. Litters can contain 2-19 pups, though ~10 is the most common. The time between births is usually 12–14 months, though it can also be as short as 6 months if all of the previous young die. The typical gestation period is approximately 70 days. Pups are usually born in dens dug and abandoned by other animals, such as the Aardvark. Weaning takes place at about 10 weeks. After 3 months, the pups leave the den and begin to run with the pack. At the age of 8–11 months they are able to kill small prey, but depend on the pack kills for most of their food. They become proficient hunters until the age of 12–14 months. Wild dogs reach sexual maturity at the age of 12–18 months. Females will disperse from their birth pack at 14–30 months of age and join other packs that lack sexually mature females. Males typically do not leave the pack in which they were born. This is unusual among social mammals, among which the core pack tends to consist of related females. Among African Wild Dogs, females compete for access to males that will help rear their offspring. In a typical pack, males outnumber females by a factor of two to one, and only the dominant female is usually able to rear pups. This atypical situation may have evolved to ensure that packs do not over-extend themselves by attempting to rear too many litters at the same time. The species is also unusual in that some members of the pack, including males, may be left to guard the pups whilst the others, including the mothers, join the hunting group. The practice of leaving adults behind to guard the pups may decrease hunting efficiency in smaller packs. Packs are separated into male and female hierarchies that will split up if either of the alphas die. In the female group, the oldest will have alpha status over the others, so a mother will retain her alpha status over her daughters. Among males, the eldest brother or the father of the other males will be dominant. When two such loner separate-gender groups meet, they may form a pack together if unrelated. Dominance is established without blood-shed, as most dogs within a group tend to be related to one another in some way. When this is not the case, they form a hierarchy based on submission rather than dominance. Submission and nonaggression are emphasized heavily; even over food, they will beg energetically instead of fight. This behavior may be due to their manner of raising large litters of dependent pups in which the loss of a single individual due to injury would mean that the hunting pack might not be able to provide for all the pack's members. Unrelated African Wild Dogs sometimes join in packs, but this is usually temporary. Instead, unrelated cape dogs will occasionally attempt hostile takeovers of packs. The African Wild Dog hunts in packs. Like most members of the dog family, it is a cursorial hunter, meaning that it pursues its prey in a long, open chase. Nearly 80% of all wild dog hunts end in a kill; for comparison, the success rate of lions, often viewed as ultimate predators, is only 30%. Schaller found that 9 of 10 wild dog hunts in the Serengeti ended in kills. Members of a pack vocalize to help coordinate their movements. Its voice is characterized by an unusual chirping or squeaking sound, similar to a bird. 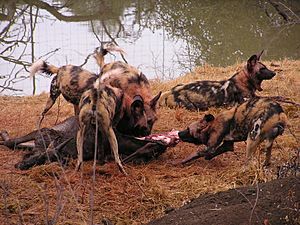 Wild dogs frequently kill larger prey via disemboweling, a technique that is rapid but has caused this species to have a negative, ferocious reputation. For this reason, even some early wildlife conservationists, such as Carl Akeley took pride in killing entire wild dog packs. After a successful hunt, the hunters will regurgitate meat for those that remained at the den during the hunt including the dominant female, the pups, the sick or injured, the old and infirm, and those who stayed back to guard the pups. The African Wild Dog's main prey varies among populations but always centers around medium-to-large sized ungulates, such as the impala, Thomson's Gazelle, Springbok, kudu, reedbuck, and wildebeest calves. The most frequent single prey species depends upon season and local availability. For example, in the Serengeti in the 1970s wildebeest (mostly calves) were the most frequently taken species (57%) from January to June, but Thompsons gazelle were the most frequently taken (79%) during the rest of the year. In the Selous Game Reserve, the most frequent prey is impala. While the vast majority of its diet is made up of mammal prey, it sometimes hunts large birds, especially Ostriches. Other predators, such as lions, sometimes steal the prey that Wild Dogs catch. Some packs are also able to include large animals among their prey, including zebras and warthogs. The frequency and success rates of hunting zebra and warthogs varies widely among specific packs. To hunt larger prey, Wild Dogs use a closely coordinated attack, beginning with a rapid charge to stampede the herd. 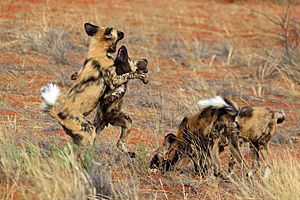 One African Wild Dog then grabs the victim's tail, while another attacks the upper lip or nose, and the remainder attempt to disembowel the animal. Male wild dogs usually perform the task of grabbing warthogs by the nose. This behaviour is also used on other large dangerous prey, such as the African Buffalo, giraffe calves, and large antelope—even the one-ton Giant Eland. Remarkably, studies indicate that this large-animal hunting tactic may be a learned behavior, passed on from generation to generation within specific hunting packs, rather than an instinctive behaviour found commonly within the species. Some studies have also shown that other information, such as the location of watering holes, may be passed on similarly. The home range of packs varies enormously, depending on the size of the pack and the nature of the terrain. In the Serengeti, the average dog density (prior to the local extinction of the species) was 1 dog per 208 square kilometers (80 square miles), whereas in the Selous Game Reserve the average density was 1 dog every 25 square kilometers (9.6 square miles). Their preferred habitat in the Serengeti is deciduous woodlands because of large prey herd size, lack of competition from other carnivores, and better sites for denning. In the Serengeti, the average range has been estimated at 1,500 square kilometres (580 square miles), although individual ranges overlap extensively. There were once approximately 500,000 African Wild Dogs in 39 countries, and packs of 100 or more were not uncommon. Now there are only about 3,000-5,500 in fewer than 25 countries, or perhaps only 14 countries. They are primarily found in eastern and southern Africa, mostly in the two remaining large populations associated with the Selous Game Reserve in Tanzania and the population centered in northern Botswana and eastern Namibia. Smaller but apparently secure populations of several hundred individuals are found in Zimbabwe, South Africa (Kruger National Park), and in the Ruaha/Rungwa/Kisigo complex of Tanzania. Isolated populations persist in Zambia, Kenya, and Mozambique. The African Wild Dog is endangered by human overpopulation, habitat loss and predator control killing. It uses very large territories (and so can persist only in large wildlife protected areas), and it is strongly affected by competition with larger carnivores that rely on the same prey base, particularly the lion and the Spotted Hyena. Lions often will kill as many wild dogs as they can but do not eat them. One on one the hyena is much more powerful than the Wild Dog but a large group of Wild Dogs can successfully chase off a small number of hyenas because of their teamwork. It is also killed by livestock herders and game hunters, though it is typically no more (perhaps less) persecuted than other carnivores that pose more threat to livestock. Most of Africa's national parks are too small for a pack of wild dogs, so the packs expand to the unprotected areas, which tend to be ranch or farm land. Ranchers and farmers protect their domestic animals by killing the wild dogs. Like other carnivores, the African Wild Dog is sometimes affected by outbreaks of viral diseases such as rabies, distemper, and parvovirus. Although these diseases are not more pathogenic or virulent for wild dogs, the small size of most wild dog populations makes them vulnerable to local extinction due to diseases or other problems. The Painted Dog Conservation (PDC) effort, based in Hwange National Park, western Zimbabwe, works with local communities to create new strategies for conserving the wild dog and its habitat. "The name 'wild dog' developed during an era of persecution of all predators when the name applied to feral dogs, hyenas, jackals and the cape hunting dogs (Pringle, 1980). 'Painted' aside from being a direct translation of the specific epithet, accurately describes the unique varicoloured markings of each individual. Apart from being misleading, continued use of the name 'wild dog' does little more than further fuel negative attitude and prejudice which is detrimental to conservation efforts." Rasmussen is one of the founders of the Painted Dog Conservation, which was originally founded in 1992 as Painted Dog Research Project. He advocates using the name "Painted Dog". 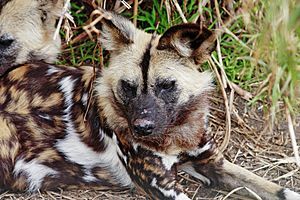 Nonetheless, "Wild dog" still is the most commonly used name for this species. Artistic depictions of African wild dogs are prominent on cosmetic palettes and other objects from Egypt's predynastic period, likely symbolising order over chaos, as well as the transition between the wild (represented by the African golden wolf) and the domestic (represented by the dog). Predynastic hunters may have also identified with the African wild dog, as the Hunters Palette shows them wearing the animals' tails on their belts. By the dynastic period, African wild dog illustrations became much less represented, and the animal's symbolic role was largely taken over by the wolf. According to Enno Littmann, the people of Ethiopia's Tigray Region believed that injuring a wild dog with a spear would result in the animal dipping its tail in its wounds and flicking the blood at its assailant, causing instant death. For this reason, Tigrean shepherds would repel wild dog attacks with pebbles rather than with edged weapons. The African wild dog also plays a prominent role in the mythology of Southern Africa's San people. In one story, the wild dog is indirectly linked to the origin of death, as the hare is cursed by the moon to be forever hunted by African wild dogs after the hare rebuffs the moon's promise to allow all living things to be reborn after death. Another story has the god Cagn taking revenge on the other gods by sending a group of men transformed into African wild dogs to attack them, though who won the battle is never revealed. The San of Botswana see the African wild dog as the ultimate hunter, and traditionally believe that shamans and medicine men can transform themselves into the wild dog. Some San hunters will smear African wild dog bodily fluids on their feet before a hunt, believing that doing so will give them the animal's boldness and agility. Nevertheless, the species does not figure prominently in San rock art, with the only notable example being a frieze in Mount Erongo showing a pack hunting two antelopes. In 2009 at the Pittsburgh Zoo, a female mixed breed domestic dog was brought in to nurse nine African wild dog pups, after the pups' mother had died. The nursing was going successfully, and the pups had gained weight. This is the first time that a domestic dog has ever been documented nursing African wild dog pups. African wild dog Facts for Kids. Kiddle Encyclopedia.